Chippewa packed up her keel and left the habor over land earlier this fall. She arrived in Florida, damaged but not terminal, to be loaded onto Dockwise and shipped to the USVI, and the island of St. Thomas. 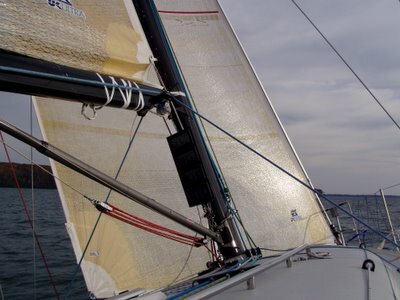 Chippewa's Owners, Dave and Kim West, are sailing her in the 2006 Caribbean racing circuit with a crew from her home port, Bayfield, Wisconsin, and the surrounding area. Check back for updates from the crew, race results and entertaining tidbits. Congratulations y'all! Wish I was there! Any more races? Need crew?